Your Woodworking ‘Bucket’ List: What’s on it? We’ve all got our list of things we want to do while we are still on this earth, even if the list is just in our heads. But woodworkers have a special list we keep separate: things we want to build before we go off to that great workshop in the sky. 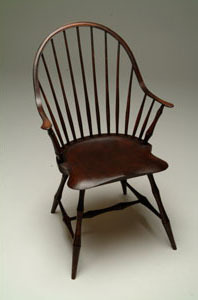 One woodworking bucket list item I’ve often heard repeated is to build a windsor chair. This iconic piece of American furniture certainly speaks to many woodworkers, and represents several lifetimes of woodworking knowledge and skill. And what better way to cross this item off your woodworking bucket list than to approach it with the help of an expert teacher? Peter Galbert is once again visiting Highland Woodworking this fall to teach a 7-day hands-on workshop in building a Continuous Arm Windsor Chair, and at the end of the week, you will leave with a beautiful piece of craftsmanship after learning ‘a whole new way of woodworking’. I mean, just look at it in the picture over there – isn’t it mesmerizing? Find out more about our Windsor Chair guru Peter Galbert, his chair-building experience and his teaching philosophy at his website, petergalbertchairmaker.com, or at his blog, Chair Notes Blog. And in the meantime, tell us in the comments below – what is on YOUR woodworking bucket list?